HMCS Protector's gun crew. Protector's armament consisted of one 8-inch Woolwich-Armstrong rifled breech loading gun of 12 tons; 5 six-inch Woolwich-Armstrong guns of 4 tons each, two of which were mounted on each beam and the fifth at the stern; 4 three-pounders, 1.85 inch calibre Hotchkiss quick firing guns; 5 ten-barreled Gatling machine guns and numerous small arms. Protector was considered a heavily armed vessel for her size; even 15 years after her construction, amazement was still felt at such a relatively small ship carrying this heavy armament. In Hong Kong, a stopover en route to China for service during the Boxer Uprising, a German naval officer enquired of Captain William Cresswell whether another ship had carried Protector's guns on the voyage from Australia. The response was a sharp negative. Edwin Argent, who had sailed to Australia with Protector in 1884 as a gunner-master continued to serve aboard the ship in South Australia. Argent served as Chief Gunner aboard Protector during the Boxer Uprising in China after a brief period back in England where he re-qualified in gunnery duties. Following the Federation of Australia, Argent served in Sydney, and returned to South Australia in 1914 as Lieutenant and served as Sub Naval Officer, Port Adelaide until his retirement in 1919. 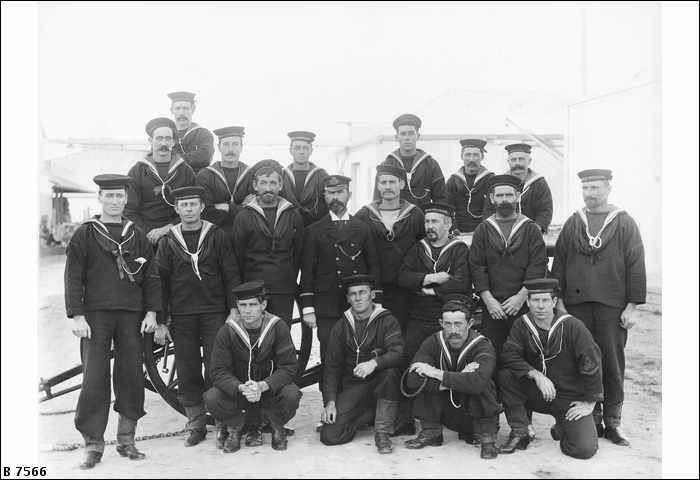 John Denzil Turner came to South Australia aboard Protector as an Able Seaman, and was a Petty Officer by 1896, and a Gunner during service in China. He was later promoted Chief Gunner in the Commonwealth Naval Forces, and eventually succeeded Argent as Sub Naval Officer, Port Adelaide in 1919.